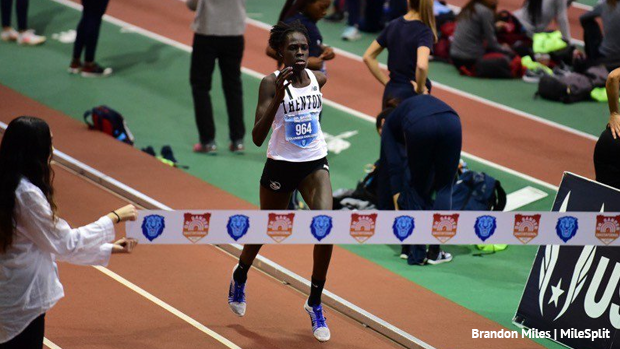 Athing Mu of the Trenton Track Club and Luis Peralta of Passaic lit up the track in the 1000m with two of the fastest times in U.S. history at Saturday's Dr. Norbert Sander Columbia Challenge Invitational at the 168th Street Armory in New York. Mu, a junior, added to what is already one of the greatest seasons in NJ history by blasting a NJ record and US No. 3 all-time 2:44.43 to win the girls race in her first ever attempt at the 1K distance. Only Sammy Watson of Rush Henrietta in NY ( 2:40.72 in 2017) and Sarah Brown of Fauquier in Va. (2:43.40 in 2005) have run faster in high school than Mu. Mu's 2:44.43 demolished the NJ state record of 2:46.09 set in 2009 by Jillian Smith of Southern Regional. Mu now owns three US No. 1 times this season and is the top five in U.S. history in all three! In addition to her 2:44.43 1K, she has also gone a US#5 All-Time 52.55 in the 400m, and a US No. 2 All-Time 1:28.54 in the 600m. And on top of that, she's also US No. 10 this season in the 200 with a 24.11. How is that for some crazy range? 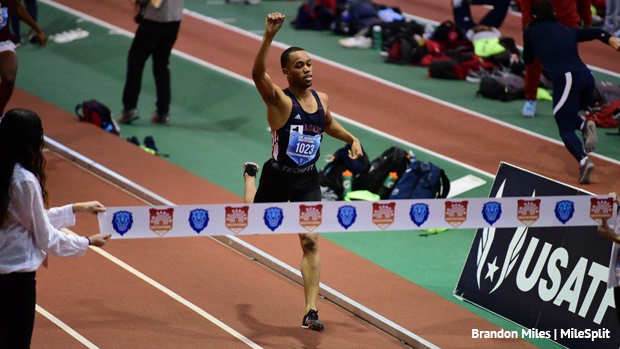 In the boys 1K, Peralta ripped a 2:24.53 to win the race and moved up to number three on NJ's All-Time list and placed him number nine in U.S. indoor history. That's Peralta's second US No. 1 time this season. He also leads the nation in the 600m with a 1:19.14. Peralta took over the state lead from Sean Dolan of Hopewell Valley, who ran 2:25.39 on Jan 10, which is now US#13 All-Time. Alfred Chawonza of St. Benedict's Prep was third in 2:25.77, NJ No. 5 all-time and US No. 17 All-Time. The only two NJ runners to go faster than the Oregon-bound Peralta over 1K are also first and second on the All-Time National list. They are Olympian Robby Andrews, who ran the national record of 2:22.28 as a senior at Manalapan in 2009, and Ben Malone, who ran a US #2 all-time 2:23.56 as a junior at Pascack Valley in 2012.